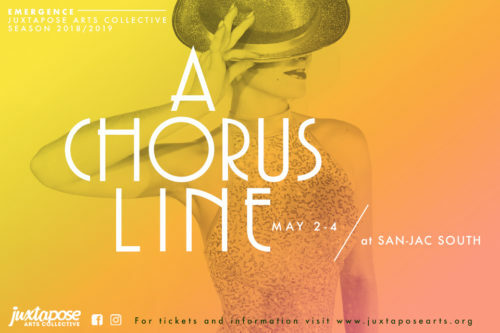 Houston, TX – Juxtapose Arts Collective is pleased to present A Chorus Line beginning May 2–4, 2019. Juxtapose Arts Collective presents A CHORUS LINE, directed by Travis Kirk Coombs. Join us in this classic musical as hundreds of Broadway hopefuls attend a dance cattle call for the next big show! Zach, the director, and his assistant eventually whittle down the audition to just 16 dancers. All tell stories of their life – some tragic, some comic. Tension builds as Cassie — once a big star and Zach’s lover but now desperate for a part — auditions, but Zach must choose only the best for his show. Juxtapose Arts Collective is a non-profit 501-(c)3 organization in the greater Houston area founded by local dancers and choreographers. At its core, Juxtapose is a multimedia dance theatre comprised of artists in residence, guest artists, and an educational apprenticeship program, Juxtapose II. It operates in affiliation with The JET-PAC to bring together artists of all walks of life; dancers, musicians, actors, painters, photographers, and filmmakers unite to present new and unique work to the ever expanding arts community of Houston.